Last call [Managers Special offer – £500 savings] on SMi’s Asthma & COPD conference, taking place on 11 – 12 April in London – to Directors, Principle scientists, Senior scientists, Associate directors, Managing directors, Medical directors, Pharmaceutical experts, Group leaders, Inhalation toxicologists of: clinical pharmacology; respiratory medicine/ science; respiratory immunology; pulmonary specialty; respiratory physiology. Regulatory requirements, human factors and usability for inhaled drug- device combination products (Quan Yang, Pharmaceutical Assessor, MHRA). 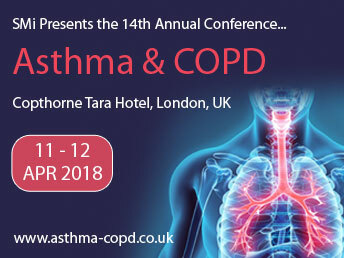 In addition – a number of other exciting presentations covering Novel Therapeutic Approaches to COPD & Asthma and Advancements in Inhalation Device Development. In addition – multiple presentations on the following areas: Early Detection – Molecular Phenotyping and Biomarker Development, Real World Studies and Disease Modifying Drugs and The Emerging Role of Smooth Muscle in Asthma.